Potential customers count on being able to find products and support for services quickly. They visit your partner/dealer locator pages more than any other section of your site. They expect to find accurate listings for partners nearby with up-to-date information on training, certifications and services. Bullseye Location’s Salesforce integration tool is a powerful add-on that can be easily configured to extract salesforce data from your account through an automated process and synchronize with locations in the Bullseye Locations Cloud–keeping your locator current and providing customers with the information they expect and need. Specify the objects and data fields that you want to synchronize with Bullseye (Bullseye can support any object or field that is accessible through the Salesforce API). Map those objects and fields to the locations, categories and location attributes in Bullseye. Finally, configure the synchronizer to run weekly, daily or hourly depending on how frequently your data needs to be updated. Using your supplied credentials and API access permissions, Bullseye filters and pulls data from your Salesforce account on a scheduled basis and makes it available for your customers to search. Bullseye’s off-the-shelf interfaces can then be easily embedded into your website. Or if you are looking for a custom solution, the Bullseye Store Locator API can be used to create a completely unique solution for your partners. Customers get accurate up-to-date information ensuring a great customer service and brand experience. Partner investment is recognized immediately as certifications or new offices open they are promoted immediately through the partner locator sofware on your corporate website. Saves on maintenance costs to manually keep data updated in multiple systems. 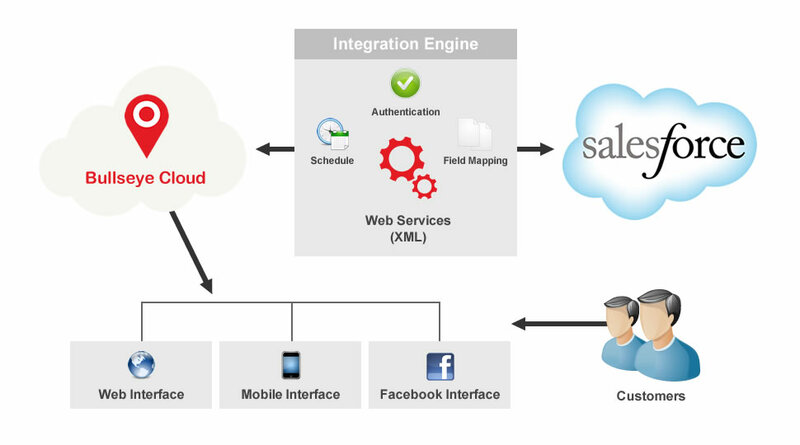 Contact us for a free analysis and consultation for configuring your Salesforce integration.